One of Lucas's favourite parts of Christmas day, once all the presents are opened, is pulling crackers at the dinner table. One joke can keep him laughing hysterically for five minutes! (And as the entire family opens their crackers round the table at the same time, he's laughing for a long time.) So, when Cartridge Save contacted me and asked if I'd be interested in taking part in their Cracker Competition, I was delighted to say yes. I had a few colour schemes in mind, but it wasn't until I started rummaging through the box of wrapping paper and ribbons tin together that things really came together. There was a sheet of Cath Kidston inspired paper and I found some red and white polka dot ribbon in the tin which matched some of the detailing on the paper. Perfect! 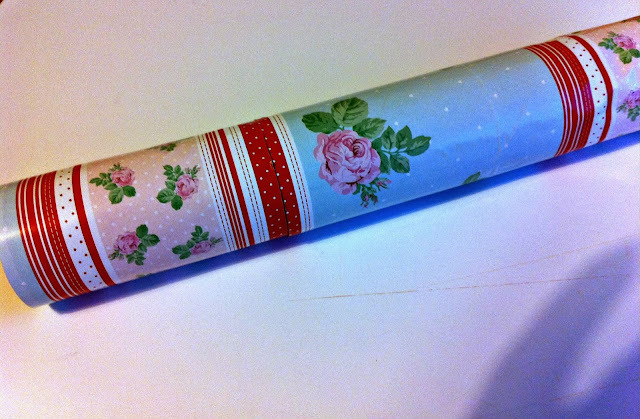 ♥ Good quality wrapping paper. 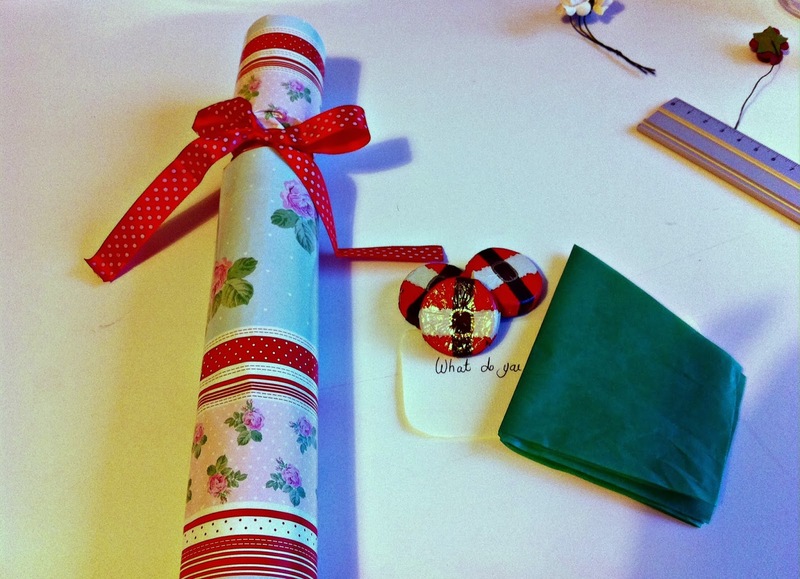 Cut a 20x30cm rectangle of wrapping paper. This is the same size as a sheet of A4 paper, give or take a few millimetres. Measure 10cm to the centre of the page from each short side, then draw a line from long side to long side. Score these lines with scissors. Go lightly. I was over-enthusiastic on my first attempt and scored all the way through on one end! Place the cracker snap along the long edge furthest away from you and secure each end with a blob of glue. 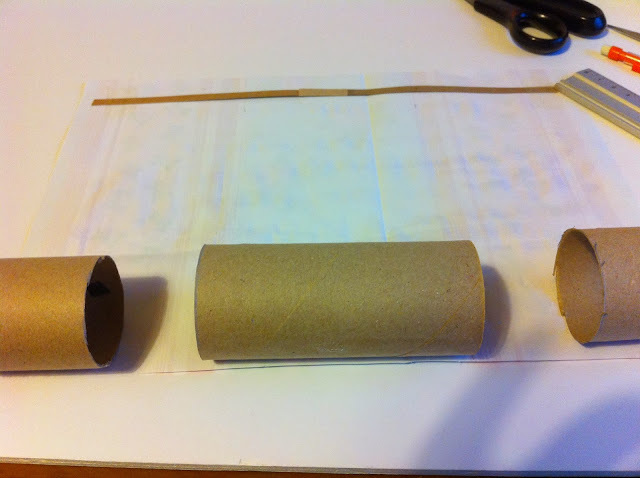 Cut one of the toilet roll tubes in half and line them up at the other edge of the paper as shown. Glue the paper; if you're using liquid glue rather than a glue stick, then make sure you don't apply too much. Roll up neatly, trying your best to keep the paper even and taut. Add a little more glue if necessary. 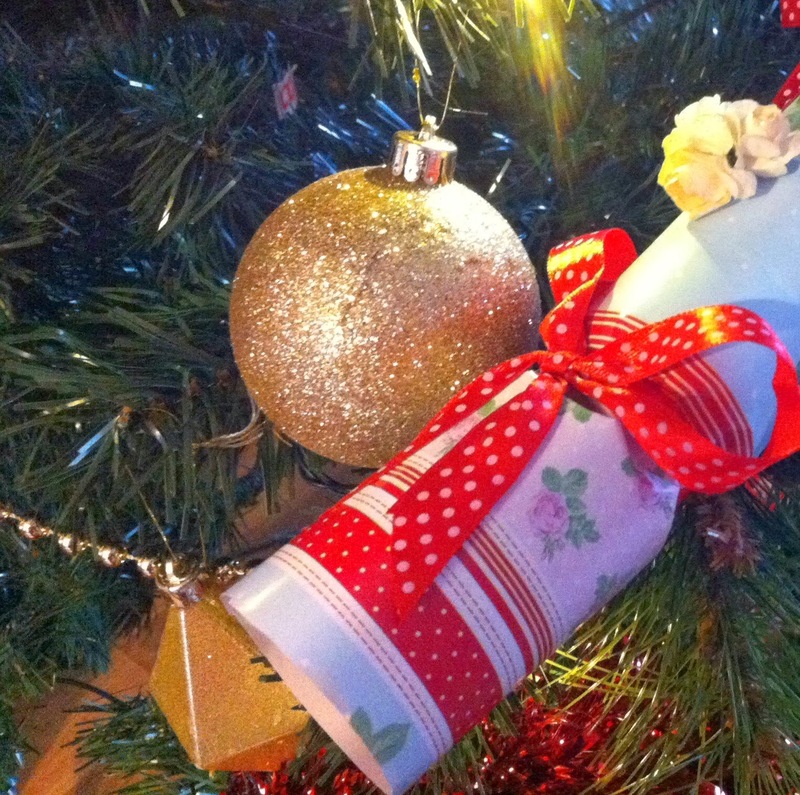 Once you've tied the first end, it's time to fill your cracker! See how nicely the ribbon matches? I filled my cracker with a joke, courtesy of Dave who delights in coming up with new jokes, some Santa's Belt chocolates from M&S--I really wanted to pop some Chocolate Sprouts inside, but they're all sold out--and I also made a little paper hat. Now that I know how easy paper hats are to make, I might make my own for Christmas! I have a ridiculous amount of hair that never fits under the hats from crackers!! Once filled, tie your second bow. I wanted both of mine to face in the same direction, giving the cracker a distinct top and bottom, but you might have different ideas! To decorate it I used some little paper roses that I spotted in Hobbycraft last week. I added some Christmas sparkle with some glitter glue, dabbed carefully on to the petals here and there. In the right light the roses sparkled beautifully! Disclosure: I received a craft gift pack from Cartridge Save. 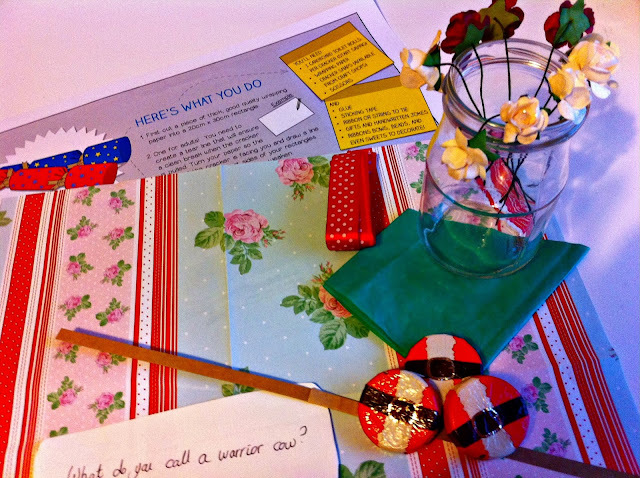 This is such a nice idea, I wish I had the time-it'd be something lovely to do with the girls. Just out of interest what DO you call a warrior cow!?! Thanks so much for your recent visit!! So gorgeous and creative! 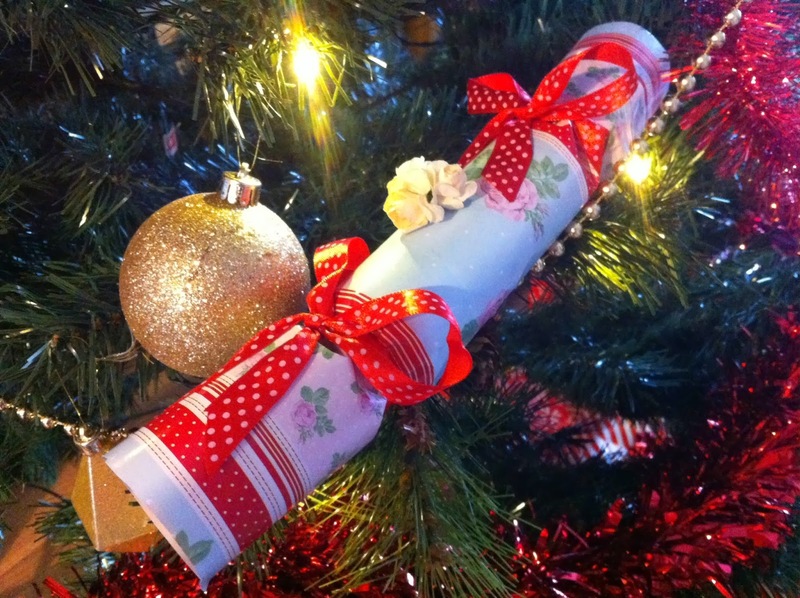 I bought musical crackers this year (very lazy of me! ), I've no idea what they'll be like! You probably didn't spend an entire afternoon obsessing over a couple of crackers, though!! 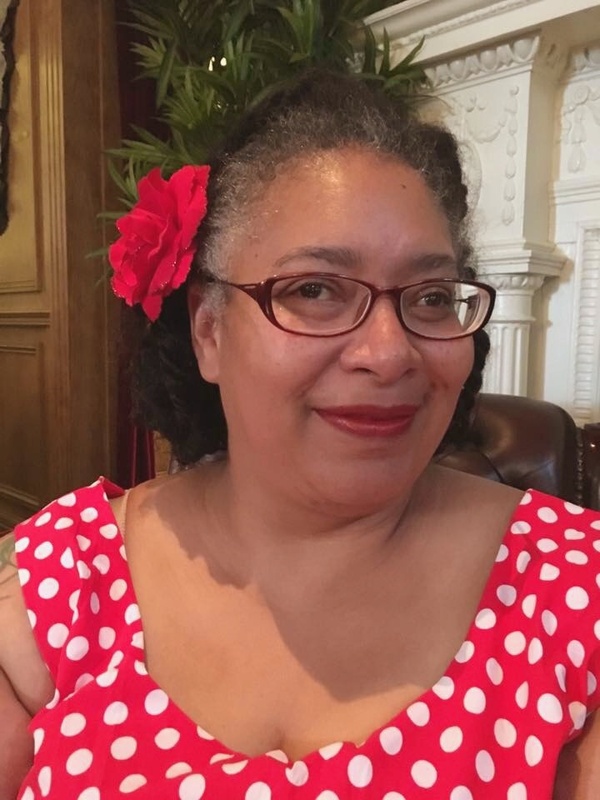 Thanks, Louisa!